What is a Pb Walk & Village? Aa family-friendly, educational event designed to promote peace literacy (i.e. the art of living peaceably) through the stories of peace heroes and peacebuilders. Teams are formed by individuals who select a peace hero to be honored. These individuals often represent an organization they belong to such as service club, faith community, business, school or civic organization. Your team is welcome to set a fundraising goal (example $1,200) and help support peacebuilding throughout the Miami Valley. Free to the public with a suggested donation of $20 (or more) to receive a signature event shirt. How are the funds handled? The 21CPLF will oversee distribution of the funds and allocate them for local peace literacy initatives and peacebuilding organizations. Peace literacy is the art of living peaceably. It is essential to creating a more secure, just and prosperous world for all. What word can change your world today? Words lead to thoughts ... that lead to action ...that lead to CHANGE! One letter can change the "word" to "world." One action can change our individual world, rippling into the outer world. Mayor Nan Whaley and local officials greet the 2017 participants of the Miami Valley Peacebuilders Walk & Village. 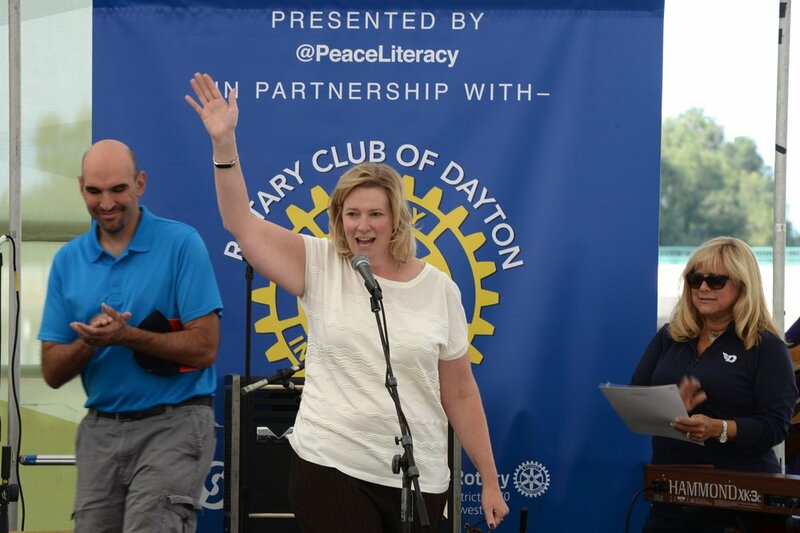 Diane Wellborn of The Omsbudsman program talks with Rotarian's Dave Williamson and Jerry Leggett about the 2017 Miami Valley Peacebuilders Walk & Village held on September 10 at the RiverScape Metro Park, downtown Dayton, OH.